I had to turn on the heat this morning. The high temperature today barely made it to 60 degrees. Come March, we’ll think a day like today is a warm, spring day. But not today. Today it felt cold and dreary. 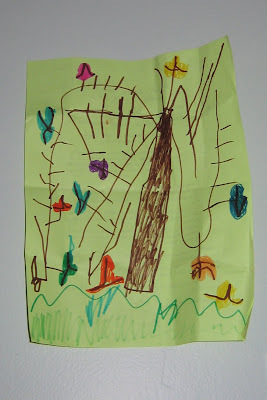 Lily drew a fall picture for her Daddy. I wanted to share this picture with you, and I looked all over the house for it. I looked in the dining room, the kitchen, and living room…no picture. I finally found it in a place of honor on the wall above Ed’s side of the bed. Lily just made fall a little warmer. I know! I still have it up on the wall! This is such a cute drawing! Isn't it sweet? I love how little kids draw! That is really cute! Thanks so much for sharing.And you're right – in February, I'll be thinking today was the warmest day ever. But I still bundled up when I went outside.Recent blog:=- What does success on the Internet look like?